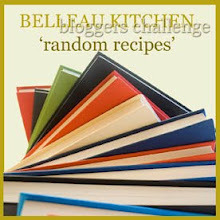 I've recently started taking part in Random Recipes, hosted by Dom at Belleau Kitchen (one of my favourite blogs)- every month he asks us to pick a book and a recipe from it at random, no cheating allowed! This month he asked us to take the date of our birthday - in my case the 29th - and select that number book from our shelf. As I counted along my baking books, my Nigella collection, my cake decorating books I wondered what I would land upon... and it was the rather prosaic slimline volume, the Great Book of Yorkshire Pudding by Elaine Lemm. It wasn't that long ago that I made the filled Yorkshire puddings from this book so hoped I wouldn't land on the same page again... and guess which page I opened it at..... "leftover cooked Yorkshire puddings." That was all very well, but to have some leftover, I needed to make some first! I followed the standard recipe from the front of the book, which I've tried before and found works really well: it's just 2 eggs, beaten in a measuring jug; an equal quantity of milk to eggs, (which was about 100ml) and an equal quantity of plain flour to milk. Mix well, and you're done! I decided this was a good opportunity to review a new product I recently found in the supermarket: Aunt Bessie's Homebake Yorkshire Pudding Mix. I've tried their ready made frozen Yorkshire puddings before, which I think are good, so I was interested to try this packet mix. It contains flour, dried egg, skimmed milk powder and a host of other things I don't recognise (propylene glycol esters of fatty acids, anyone?) and all you do is mix it with water. I halved the quantity - I actually weighed the packet mix to make sure I used half - and while the packet said it makes 12, so I was expecting 6, I actually only managed to get four out of it. I'm treating you to such exciting photos today... it will get better, I promise! My homemade ones are on the left and the Aunt Bessie's are on the right. I wondered if maybe I hadn't cooked them for long enough - I can't remember if I followed exactly what I said on the packet- but they seemed properly cooked, they just hadn't risen as much. They were also a lot denser in texture, but they did taste nice. My boyfriend could tell which ones were my own though and we did prefer them! I can see the benefit of having a packet mix like this in the cupboard as you only have to add water, but it's not hard to make Yorkshire puddings and I think I'll be sticking to my own recipe in future. We had these for Sunday lunch with roast beef and cauliflower cheese for me, and Cumberland sausages for my boyfriend. Then luckily I did have some left over... so I could properly do my random recipe! The Great Book of Yorkshire Pudding has some really interesting stuff about the history of the dish and the different ways they are eaten, and some traditional recipes from the days of Mrs Beeton as well as some modern twists. The page that I opened the book on suggested: "For the sweet-toothed try them simply with milk and sugar or fancy with apple sauce and cinnamon." Milk and sugar sounded weird - though this is the same mixture you make pancakes from, which I eat with lemon and sugar - so I decided to try the apple sauce option. In my haste to try it though I forgot the cinnamon! It was quite nice but I think I'll stick to having my Yorkshire puddings as a savoury dish with a Sunday roast. A little bit random if you ask me... so it definitely lives up to the name Random Recipe! Dom, I hope I get a nice cake recipe next time! Definitely random but I suppose that is what the challenge is all about. I think your yorkshire puddings look a lot nicer than the packet mix, does make you wonder effect all the extra ingredients have. When I was a child, a regular pudding was slices of apple cooked in a yorkshire pudding batter, so leftover YPs with apple sauce sounds quite tasty to me! Very random. You've definitely beaten Aunt B very convincingly. I know that it's very traditional to have sweet Yorkshires but I've never been entirely persuaded by the combination when I've tried it. I love how much difference there is between yours and the packet mix - pretty conclusive evidence that homemade is best!! As I read your post, I thought it was just like one of those Maths problems teachers give you where you have to answer one question to be able to answer another. Hated Maths but I love that you made your puddings for the express reason of leftovers. Yours are definitely much more beautiful than the packet!